Spanish Blog: Spanish Worksheets Galore! Ever dream of having access to hundreds of Spanish worksheets? Probably not. But if you're a Spanish teacher, being able to quickly find and print a nifty worksheet on a variety of topics is an enormous boost to productivity. 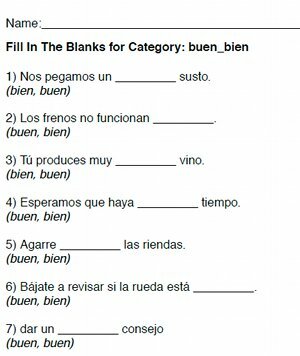 To meet this need, we have launched a Spanish worksheets section that includes eight worksheet types with over 50 categories of worksheets in each type. For additional customization, you can use our Worksheet Creator to mix worksheet types and categories, or to customize the number of items per page. Do you have an idea for a worksheet type that you would like to see on our site? Let us know.